I interviewed Cathy Fink of the duo Cathy Fink and Marcy Marxer. We talked about everything from winning Grammy’s, to “Dancing in the Kitchen”, to the mother of children’s folk music, Ella Jenkins. Listen on to see why I Had to Ask! Jack Lawerence has been playing at MerleFest since it’s inception. I had the chance to sit down with him after a set and talk about the music, memories, and moments at MerelFest. I talked with Jerry Douglas about his work with the Transatlantic Sessions, his family, and being the “King of the Dobro.” Listen on to see why I Had to Ask. The next episode in the summer I Had to Ask series is a short interview with Todd Albright: a 12 string folk guitarist from Detroit Michigan, and who likes his steak cooked medium. 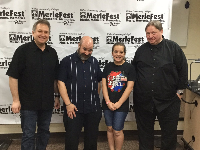 To kick off our summer series of podcasts here is an interview with the Kruger Brothers from MerleFest 2017. I talked with Jens about composing his new composition, Roan Mountain Suite (the Brother’s new album). We also talked about the international fan base, and they gave lots of advice. Ken Tizzard’s life has been completely supported by music, but, he does it because he feels that it is the right thing to do. In preparation for MerleFest 2017 I Had to Ask Ken Tizzard about his career. And, he told me about his musical style focusing completely on relating to you, the audience member. Listen on to see why I Had to Ask! Peter Rowan was at the very first MerleFests and has seen them change over the past years. He remembers sitting on the back of a flat bed truck and playing with Jerry Douglas and Doc Watson. And he remembers the day Doc Watson died thus spurring his song “Doc Watson Morning.” But, Peter Rowan also remembers the good times with the Watson’s before Doc and Merle’s deaths. As I talked with Peter Rowan about MerleFest and how the Watson family was influential on his search to find a “musical leviathan.” Listen on to see why I Had to Ask. It is always especially nice to discover musicians like Jorma Kaukonen are as down to earth and as friendly as the next guy. I talked with Jorma about everything from Jefferson Airplane, to MerleFest 2017, to his Vietnamese Pho restaurant and music camp Fur (or Pho) Peace Ranch. We even cleared up a music festival misconception. Listen on to see why I Had to Ask.